We’d love your help. Let us know what’s wrong with this preview of THE GIRL AT MIDNIGHT by Melissa Grey. To ask other readers questions about THE GIRL AT MIDNIGHT, please sign up. Melissa Grey penned her first short story at the age of twelve and hasn't stopped writing since. As an undergrad at Yale, she learned how ride a horse and shoot a bow and arrow at the same time. She also has a Masters in Art History but that's a much less useful skill. She is the author of The Girl at Midnight, The Shadow Hour, and the Savage Dawn, out now from Random House. 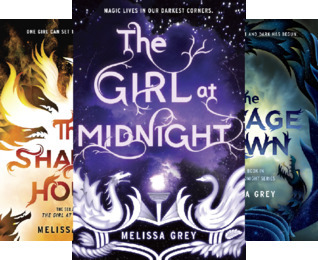 To learn more about Me Melissa Grey penned her first short story at the age of twelve and hasn't stopped writing since. As an undergrad at Yale, she learned how ride a horse and shoot a bow and arrow at the same time. She also has a Masters in Art History but that's a much less useful skill.